Rihanna is always working. She consistently comes up with new partnerships that help further her brand and cement her status as one of today’s icons. 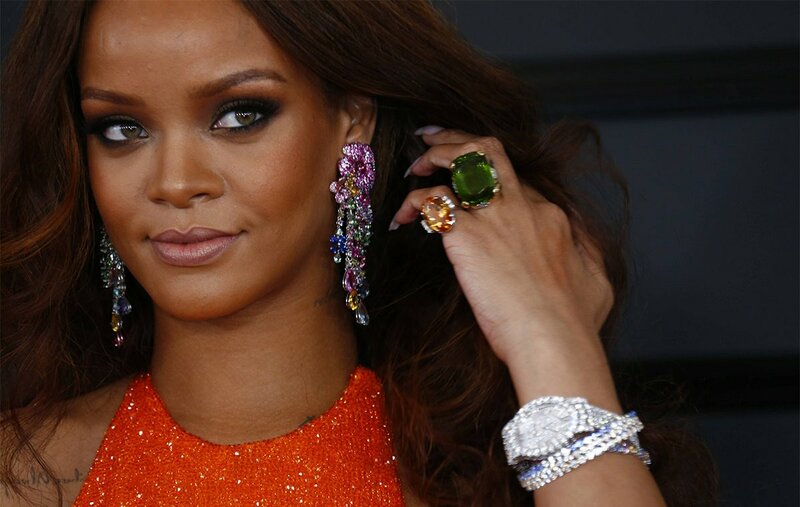 This week Chopard announced that Rihanna co-designed two jewellery collections with Caroline Scheufele, the brand’s co-President and Creative Director. The collaboration should not come as a surprise to anyone who pays close attention to Rihanna’s red carpet style. She wore a stunning Chopard cuff on the night she won her first Grammy award and has chosen the brand for other momentous occasions in her life such as the first Diamond Ball. “Rihanna and I collaborated closely on the collections so you can feel her unstoppable energy, strong creativity, and inherent sense of design in every piece. With her unique style, she redefines the way people see and wear jewelry”. While Rihanna found the process of designing jewellery to be an exciting new challenge. I have always been in love with Chopard’s exquisite jewelry, so to actually design collections with them is something I still can’t believe. It was a really incredible process and I learned so much! I can’t wait for everyone to see it. The limited edition high jewellery collection is inspired by the tropical gardens of Rihanna’s native Barbados and the island’s Crop Over festival. She gave us a taste of these stunning pieces (those botanical earrings and a marquise diamond ring) on the red carpet at the 2017 Grammy Awards. She also wore a pair of transformable diamond earrings on the cover of Harper’s Bazaar’s March 2017 issue. This collection debuts in May 2017 in celebration of the 70th anniversary of the Cannes Film Festival. Rihanna may make an appearance there in support of the launch. Take a closer look at two of these pieces below (price available on request). In contrast to the Haute Joaillerie collection, the 9-piece fine jewellery collection is a minimalist’s dream. Rihanna loves rose gold and so all of these pieces utilise that metal. She also selected the jungle green ceramic featured. “R♥C” is engraved on each piece. You can pre-order this collection now on Chopard’s website and at their boutiques. Your order will ship in June. Prices range from $1,460 for a ring to $11,140 for a necklace. Check these out below. Click here to pre-order the Rihanna ♥ Chopard collection now.